How many of these can still be around? In retrospect, the American spec E12 530i was not one of the best BMWs ever sold in the US, but it was damn good in its day and still a lot better than many 70s era cars. The 530i was introduced to North America in 1974. BMW, like most car manufacturers, was still trying to figure out how to efficiently comply with US bumper and emissions standards. Being a car that was not designed exclusively for the US market, BMW, like most European manufacturers, just tacked on some huge "diving board" (more like dining room table) bumpers. Besides looking horrible, they added a lot of weight to the car. BMW got clever in meeting emissions standards, using a thing called a Thermal Reactor. In a nutshell, the Thermal Reactor is a secondary combustion chamber designed to blow up the rest of the gas in the exhaust. A good idea on paper, but in real life they got hot, very hot. (At night you could see the Thermal Reactor glow red after a spirited drive.) This caused burnt valves and warped or cracked heads. BMW, to their credit, replaced the damaged heads on the 530i long after the cars were out of their warranty period. When the heads weren't warping and the valves weren't burning, the 3.0 liter 6 was a pretty good engine. It put out 174HP and gave the car a top speed of 124 MPH. 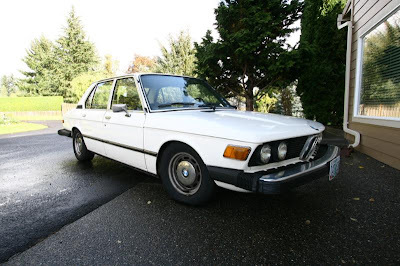 In 1974 Road & Track magazine made the 530i one of its Ten Best Cars. This car appears to be a survivor in good condition. Interestingly, it has manual windows which, while common in Europe, were not very common in the US. It has a salvage title from a minor accident, but the damage appears to have been repaired. E12s rusted badly. Although it looks clean, this car should be checked for poorly done rust repair. The seller says it runs and drives great and describes it as a "very original clean reliable car". It needs a little work, but nothing serious. The seller is looking for $1400.00 for this car. Even if you pay the asking price and have to put another $500.00 into it, you still wind up with a very cool, fairly rare, old BMW for less than $2000.00. Given what little else you can get for $2K these days, I'd call this car, flaws and all, a bargain. 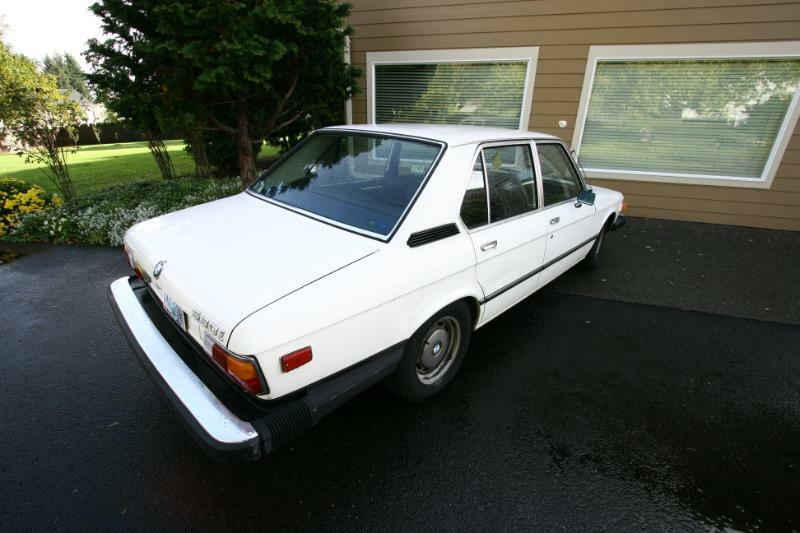 Located in Portland, OR, click here to see the Craigslist ad. My parents had this exact car in dark blue on black, with a black vinyl roof that was apparently covering up some kind of roof damage. Being in Montreal, 6 years of snow and salt were unkind to it and they repainted it and sold it to a guy who wanted to drive it cross country. You have to admit, saying you have a thermal reactor on your car sounds pretty cool. Too bad it didn't give the car extra power. 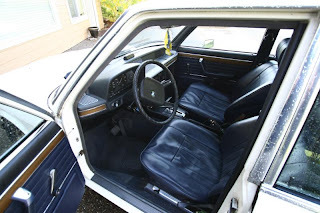 I took delivery in July 1975, new at the factory in Munich, of this exact model, outside colour metallic brown, inside beige, US specs, stick shift, A/C, thermal reactor. Drove it all over Western Europe, brought it to the US and drove it to work for 30 more years and now garaged. Had it repainted, down to bare metal, and reupholstered, identical to original. Recently had the head, valve gear and radiator replaced, engine tuned. Mileage: 191'000 mi. All Michelin inc. spare. 20 original tools in BMW designed compartment recessed in trunk lid. A few spare parts and complete English language repair manual published by BMW. Really a terrific automobile that I plan to keep and use, take it to élégance shows, till its rarity and condition attract another car geek willing to recognise its value, compensate me for outlays and give it a good home.